A growing number of couples are choosing to celebrate their wedding in a less than traditional manner. So why not surprise your guests and arrive at your reception in style in our Bell 206 LongRanger helicopter. We have completed many wedding flights over the years to some wonderful locations, so we understand the expectations on the day. We allow extra time for photos, appreciate the tight time schedules and quite often the surprise elements for your friends and family. 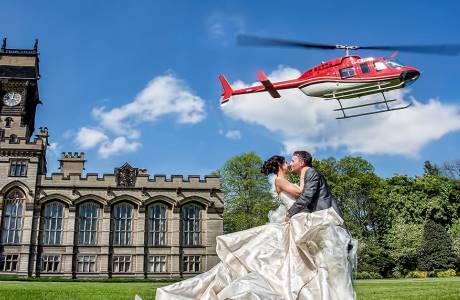 We have forged strong links with a number of well known wedding venues around the region and this makes any wedding day run smoothly, however if you have found a new romantic location to have your special day then we can no doubt make the necessary arrangements to make your flight a reality. At Heli-Jet Aviation we understand that the requirements for every trip are different, so we will tailor make a package especially to suit your needs. Simply contact a member of staff with your requirements and we will do the rest for you. Our wedding packages start from only £599 inc VAT.